8 Looking to Purchase a New Trade Show Display? There are many types of trade show displays available, each offering a unique opportunity to showcase your business, products and other important information in eye-catching ways. Choosing the right display for your company depends on your budget, goals and needs. No matter which exhibit type you select, keep the following tips in mind. 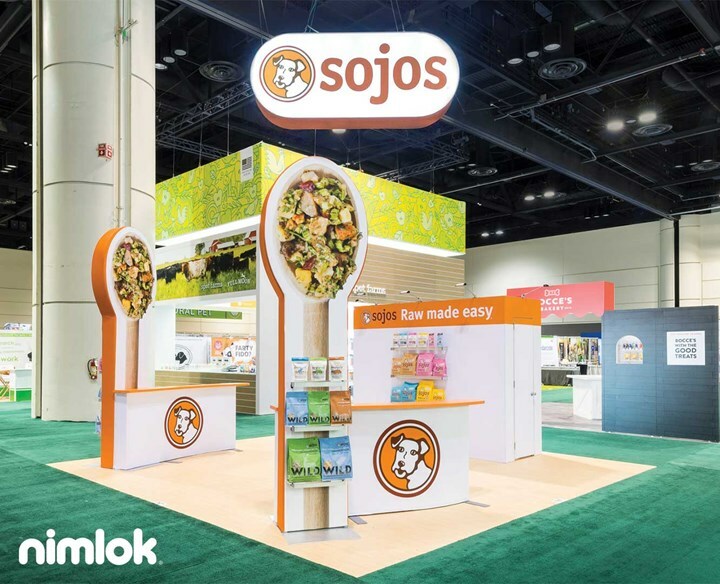 Branding – A well-designed trade show display should reflect your brand, so make sure your display keeps true to company brand standards, colors, imagery and logos. 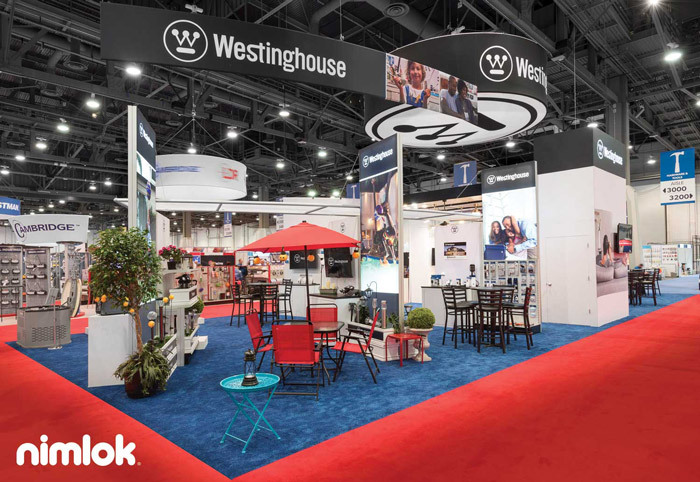 Impact – The best trade show displays inspire visitors to learn more about a company and leave a lasting impression , so design your display with impact in mind. 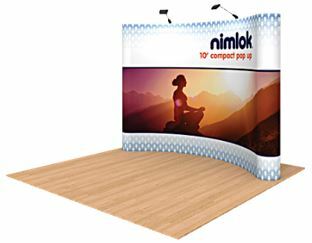 Trade show displays come in many dimensions, with the standard sizes being 10’ x 10’, 10’ x 20’ and 20’ x 20’. Likewise, there are various trade show exhibit layouts. We list the three most common layouts along with a short descriptions below to help you get better acquainted with your floorplan options. A 10’ x 10’ booth size is the most popular and most readily available size for most trade shows & events. Check out our 10’ x 10’ guide, linked below, for some additional information on maximizing the value of your next trade show! Typically 20’ x 20’ or larger, island trade show exhibits are exposed to aisles on all four sides. Hanging structures are usually permitted above island exhibits with height restrictions varying by trade show, but typically it is between 20’ and 30’. The Axis Layout utilizes a centralized structure as an axis point for the exhibit design, with independent structural elements positioned near the corners and perimeter of the exhibit. The open floor plan of the Axis Layout allows traffic to flow in and out of the space organically, reducing clutter and traffic build up. The Presenter Layout features a theater/presentation and additional supporting display elements. If you are looking to engage, communicate and employ storytelling at your trade show, consider the Presenter Layout. To learn more about island trade show exhibits, download our Guide to Island Exhibits explores four of the most common island exhibit layouts to help you select the best floor plan for your trade show objectives. An inline trade show exhibit, also known as a “linear” exhibit, abuts one or more exhibits on its flanks or back. Generally, inline exhibits are 10’ x 10’ or 10’ x 20’ with a max backwall height of to 8’. The term “perimeter booth” will usually refer to an inline display that is located along the outside wall of an event floor. One key advantage for inline displays is that many can reconfigure into multiple spaces, most commonly 10′ x 10′ and 10′ x 20′ booth sizes. This gives multi-event exhibitors the ability to scale an inline trade show exhibit up or down depending on the exhibit requirements of a venue or by need. Hanging structures are not permitted for inline exhibits. Peninsula trade show exhibits share one side with another booth, with three out of four sides exposed to an aisle. For many events, the shared side graphic must be plain and cannot contain logos, branding or advertising. 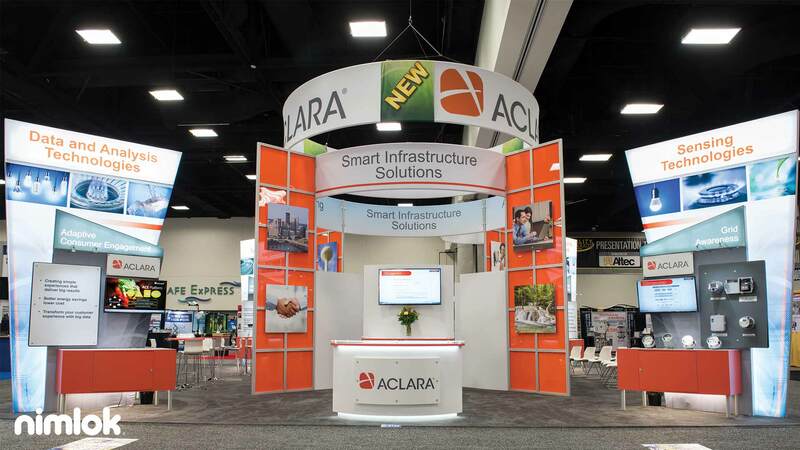 The typical size for a Peninsula booth is 10′ x 20′ or larger. Hanging structures are usually permitted for peninsula exhibits that are 20’ x 20’ or larger. Portable trade show displays are generally a faster and more affordable option ideal for first-time exhibitors, exhibitors in need of a quick solution and for companies working with a limited trade show budget. Though portable displays are a lower cost option, they can have just as great an impact as a fully custom exhibit. 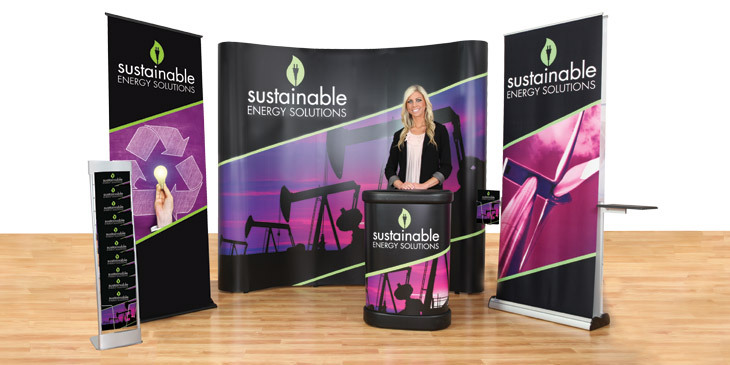 Many portable displays have large graphic backgrounds that provide the opportunity for effective branding and connecting with attendees. Portable displays are easier to set up and require less assembly compared to modular or custom exhibits, are made from lightweight materials and come in a variety of sizes, including 8ft, 10ft, 20ft and tabletop. Exhibitors can customize portable trade show displays with custom printed graphics and various accessories like kiosks, counters, lighting and more. The lightweight construction and portability of these displays makes them easy to ship and ideal for exhibiting at multiple shows in a short period of time. Despite being lightweight, portable displays are designed to withstand multiple uses if cared for properly. Below, we list the most popular portable displays and their advantages. 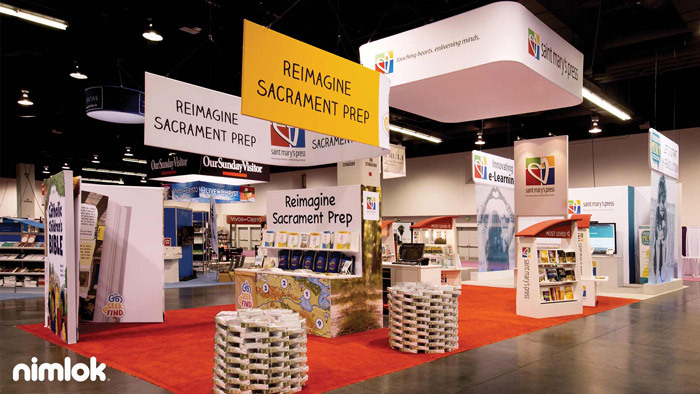 Banner stands are one of the most widely used and versatile trade show displays. They have become a staple with trade show marketers, retailers and organizations looking for display signage because they are cost-effective, highly portable and easy to skin with custom graphics. 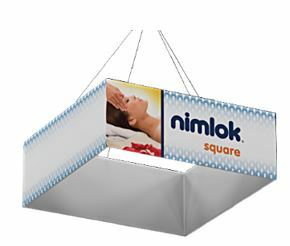 Retractable Banner Stands – Retractable banner stands roll neatly into a base unit to protect graphics during transport and storage. The retractablility of these banner stands also provides additional portability for users. 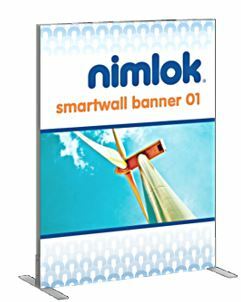 Cassette-style Banner Stands – Cassette-style banner stands are similar to retractable banner stands in both style and function. However, cassette-style banner stands feature interchangeable graphic cassettes which can swapped out to change up messaging from show to show. Fabric Banners and Backwalls – Fabric banners are high-quality banners that can be used for both outdoor and indoor events. Fabric banners utilize push-fit fabric graphics that slip into an aluminum extrusion frame for easy setup and also affords exhibitors the opportunity to skin the frame with different graphics. Table covers and runners are also mainstays of the trade show and convention world, offering a stylish solution and increased branding opportunities for exhibitors with tabletop displays. Printed on washable polyester using a dye sublimation print method, table covers and runners are printed blank or with custom graphics depending on an exhibitor’s needs. Hanging structures are aluminum framed hanging displays adorned with pillowcase graphics and come in a variety of shapes, such as rings, squares, shields, pinwheels and more. 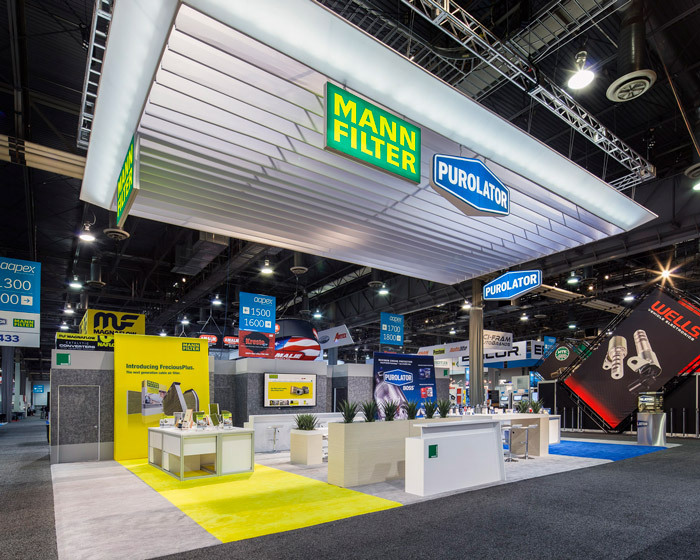 Hanging structures help exhibitors broadcast their brand presence at an event from all angles with distinct, eye-catching flair. Tension fabric displays utilize aluminum pole, extrusion or collapsible frames adorned with close-fitting fabric graphics to create picturesque backdrops. Depending on the frame, the graphics for a tension fabric display push over the frame like a pillowcase, slip into extrusion channels or are applied directly to the frame via Velcro. Accessories such as lighting, shelving and monitor mounts can be added to tension fabric displays for additional functionality. Pop up displays are primarily used as backdrops to display brand messages and product capabilities. Pop up displays use a collapsible, accordion-style frame that “pops” open, creating an instant frame ready to be adorned with vibrant graphics. Additional options such as lights, monitor mounts and literature sleeves can be added to customize a pop up display. Pop up display cases can be converted into a counters by covering them with a fitted fabric graphic, adding to the displays versatility. Outdoor displays provide exhibitors with a sturdy display designed to to be used outdoors and are the perfect display solution for outdoor events during the spring and summer months. Exhibitors should avoid using outdoor displays in adverse weather conditions and make sure displays are properly staked or weighed down when windy. The water resistant polyester canopies of outdoor tents provide exhibitors with a professional display to show off brand messaging and imagery and also provides booth staffers and visitors with a practical shelter from sunlight and light rain. Outdoor flags are colorful, inexpensive and portable, making them the perfect solution for exhibitors looking to advertise their presence outdoors. Unlike static signs, outdoor flags capture the wind and move. Outdoor banners are lightweight and portable and can be easily positioned where impact and viewership will be greatest. Outdoor banners are designed to survive the elements, so no matter the season, exhibitors can count on these durable displays to broadcast messaging. Prefabricated modular trade show displays are pre-built, sophisticated displays constructed using standardized pieces as building blocks. They offer a modern look aluminum extrusions and a variety of graphic materials and textures. Prefabricated modular displays allow exhibitors to start with a base “kit” and use as-is or be customized per specific needs. This can be especially useful for a first-time exhibitor, as the kits help to simplify and streamline the entire exhibit design process. Modular kits are designed to be easy to ship and set up as well, saving both time and money. Modular displays are available in a variety of sizes and, depending on the design, can include accessories such as counters, shelving, lights, monitor mounts and literature holders, or can be modified to reconfigure into a different size. The ease of customization and exhibit versatility make prefabricated modular displays ideal for multi-show exhibitors with simple needs. Custom modular exhibits feature some of the same base elements of prefabricate modular systems such as aluminum extrusions, fabric graphics and accessory pieces, however these exhibits are built entirely to exhibitor specification. Designs can range from simplistic to more complex. 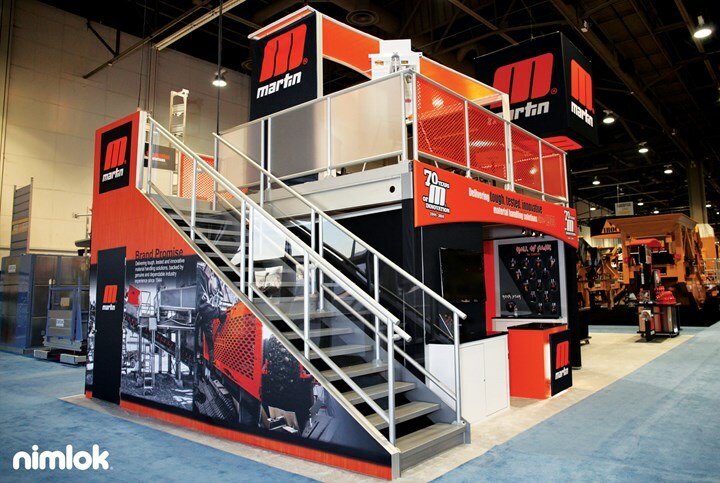 Many exhibitors choose custom modular exhibits because they combine the straightforward setup and versatility of a prefabricated modular system with the eye-catching look of a custom-designed booth. Depending on the size and intricacy of the design, these booths may require professional setup. Custom trade show exhibits are made-to-order exhibits that are designed and tailored to meet the specialized design needs of an exhibitor. Custom trade show exhibits are design with a strategic approach that factors in the goals of an exhibitor, intended audience, budget and overall marketing strategy. Each custom exhibit is unique to the exhibitor, and includes a wide variety of custom-fabricated materials such as wood, fabric, laminates, glass and plastics. 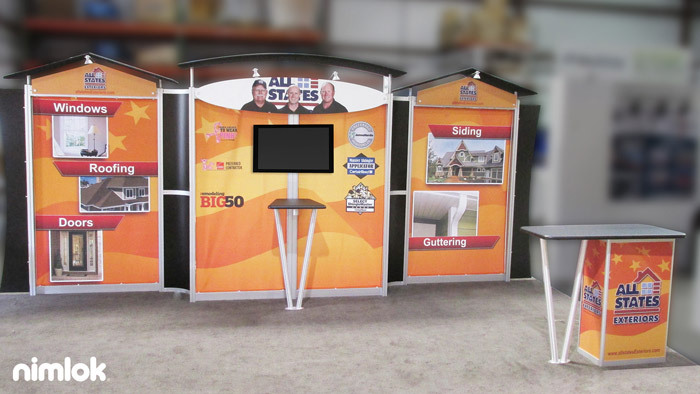 Custom trade show booths vary in size, from smaller 10’ x 10’ designs to larger-scale solutions. Typically, custom exhibits require a bigger budget than custom modular exhibits, and usually require an on-site crew for setup. 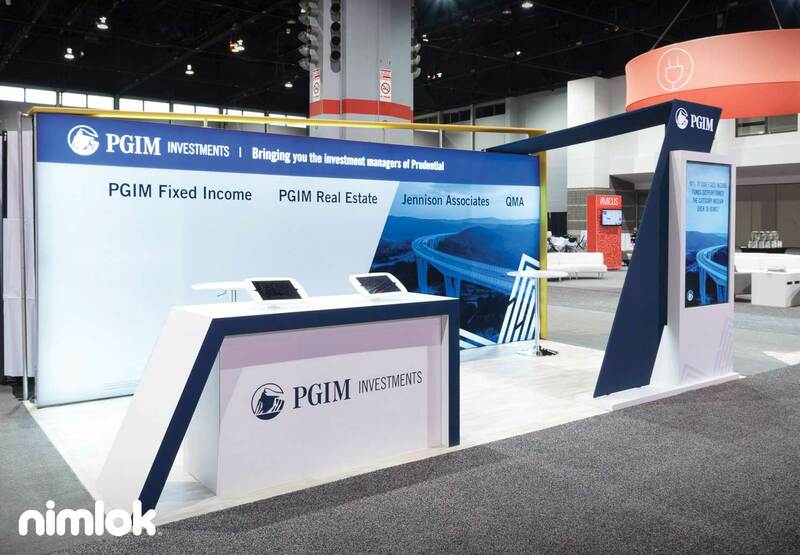 Although fully custom exhibits require a greater investment, there is a greater potential to stand out from other exhibits, capture the attention of attendees and draw in the most booth traffic. Ultimately, this can lead to greater success in achieving your trade show goals, whether it’s sales, leads or brand exposure. Rental trade show displays are displays comprised wholly or partly of rental hardware components. Rental displays are generally a third of the cost of purchasing a custom exhibit and allow exhibitors the opportunity to experience different designs and layouts without having to purchase, store and maintain one exhibit. Below we have listed three key advantages to trade show booth rentals. One of the main advantages of renting a trade show display is the fact that you get an all-in-one pre-designed rental system. Each rental system offers features of a custom exhibit, but at a more affordable cost. You can piece together a great display that will absolutely be on par with your competitors at the show. With the added bonus of rentals being modular and customizable, you can change up your company’s booth from show to show. When renting a booth, you can mix and match different features and options. You do not have to settle for a final design. Instead you can try a range of different configurations and see which one works the best for your needs. If you love the design you choose then you can purchase it. Rental trade show booths offer speed and convenience and can be transported easily. If you can find an expert exhibit partner to rent from locally, you can save on shipping cost and have better on-site consulting . Is a Rental Display right for you? Not sure whether to rent or buy your next display? Take our quick Rental Quiz to help you decide or download our rental guide for more information. Looking to Purchase a New Trade Show Display? By researching and learning about the various types of trade show displays, you are now better equipped to pick the right solution for your brand. If you would like to learn more about exhibiting at trade shows, download Nimlok’s Beginner to Winner e-book, designed to help you become a better exhibitor in five concise chapters. Download your free copy today! This was a great read! Exhibits products have come a long way over the past decade as a successful method to take business to higher levels. And I am glad to know that we can find such an informative stuff about these budget-friendly exhibits just sitting at our places. Thanks for sharing those warnings. I will surely keep your advice in mind for future. Thanks and please Keep sharing!! Thanks for sharing your article about tradeshow displays. I like that you talked about how you must make sure that your trade show display will reflect your brand and leave a lasting impression on your customers. My husband is looking to join a tradeshow where we can sell the goodies that my daughter is baking. We believe that her products are one of a kind and deserve to be recognized. I will make sure to find a printing company that will help us create a display that will leave an impact on our future customers. Wow I’m overwhelmed lol! I loved looking at all these trade show display types! There’s so many ways to set up your displays and just be creative with it. I LOVED looking at the different types you have here. So fun! Rental trade show exhibits are very well designed and can be very attractive to company and clients. This double deck exhibit looks cool. I appreciate you helping me learn more about the exhibit types and trade show displays. I like how you mentioned that exhibits come in a wide variety of layouts, styles, and functionalities. I guess this is where we should start on choosing the types of booth or show display that we will be using. Letting them to know the exact benefit of banners and display stands. Good to know!